Do you love your hi-hat stand but need more space on the left side of your drum kit? Then you need to take a look at this remote hi-hat pedal! With its sturdy, all-metal construction, the hi-hat remote stand includes a drum key and lockable hi-hat clutch with cymbal felts, and also features a stable double spine weighted pedal plates for a sturdy, flat-footed kick, and a fully adjustable power cam system to accelerate the tension of the pedal. The double locking spring tension rod knob on this hi-hat remote pedal includes five different settings (numbered 0 to 4) and guarantees your personal tension settings never change while playing. In addition, the foot stop prevents your foot from slipping forward while the adjustable floor spikes on the feet prevent slipping during your sets. The hihat cymbal remote stand’s frictionless bearing hinge enhances the smooth drum pedal action. We encourage you to compare this hi-hat cymbal remove pedal to other remote hi-hat stands online. This deluxe remove hi hat cymbal system is sturdy and durable. 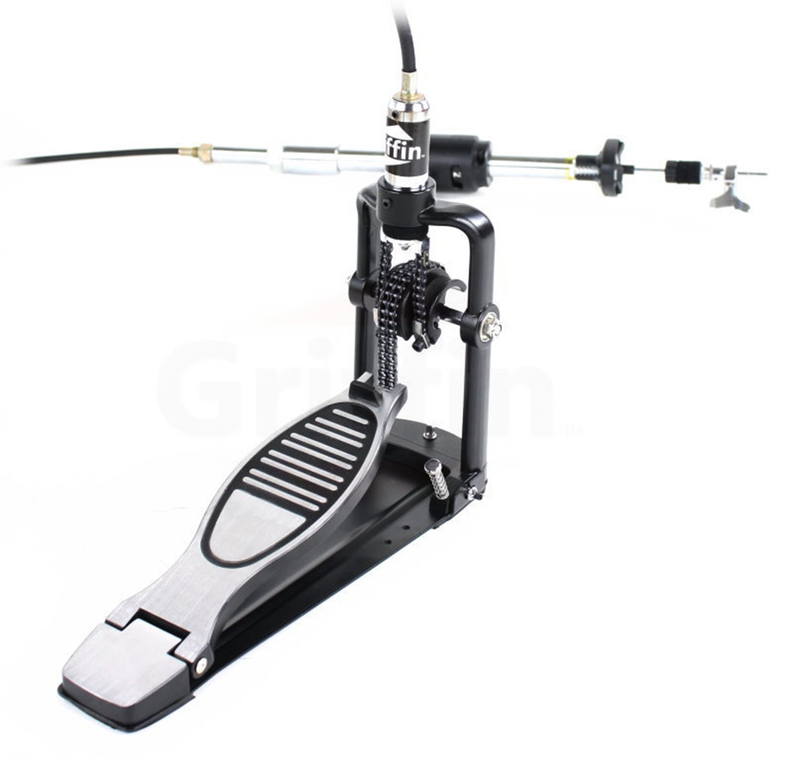 You can trust this remote hi-hat cable system stand to accommodate all of your hi-hat pedal needs. 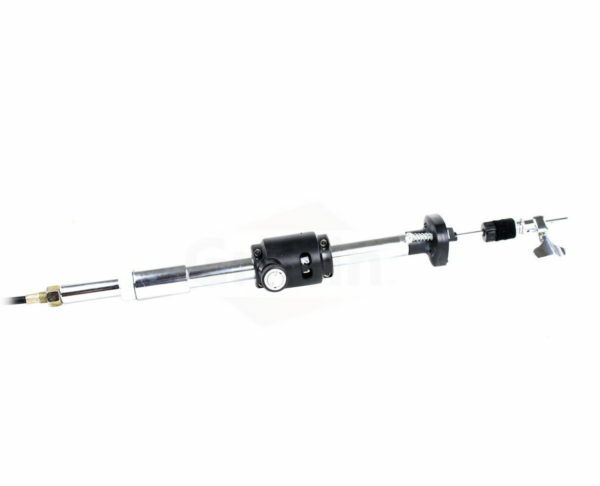 Try finding another remote hi-hat stand able to work this hard for you at such a cheap price; it cannot be done! If you shop around, you will realize we offer the lowest price for remote hi-hat pedals. 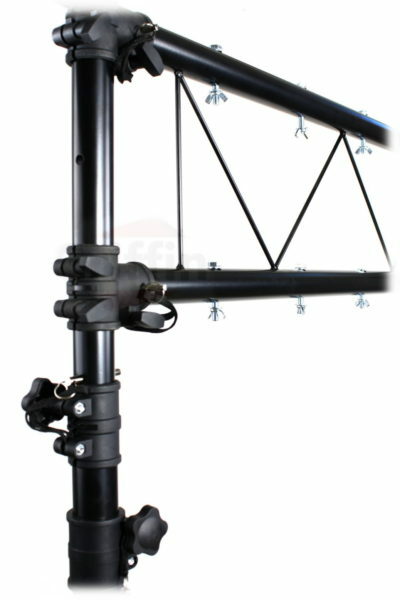 Buy today with peace of mind knowing you are getting the lowest price possible for this hi-hat cymbal remote stand. VARIATE YOUR PLAYING STYLE: Do you prefer playing with an open set up, instead of crossing up? Then this remote hi-hat pedal is for you! 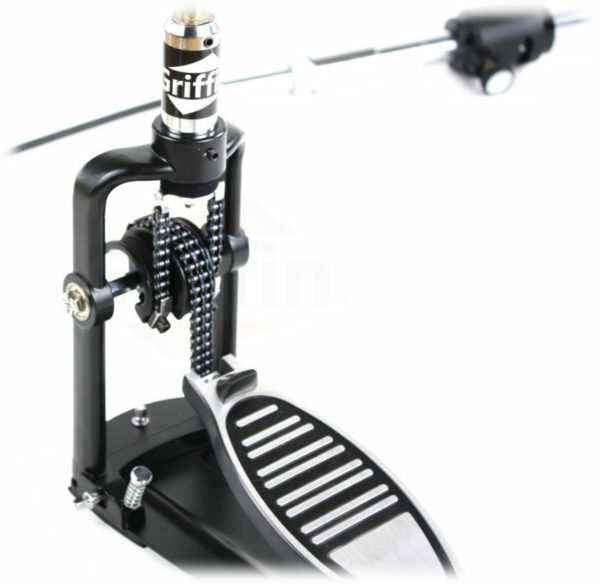 Allowing you to position your cymbals according to your utmost convenience and comfort, this remote high-hat cymbal stand foot pedal will expand your kit’s playability and save space on the left side of your drum kit. Its sturdy, all metal construction and sleek, chrome finish make this drum hardware a must-have for any drummer. ADJUST THE TENSION ON THE FLY: Featuring a double locking spring tension rod knob that allows you to easily adjust the tension settings according to your preference from 0 to 4 (5 settings), this remote high-hat pedal stand is an excellent choice for any drummer with a hat intensive style. With a perfectly smooth feel that sounds and feels just like your regular hi-hat pedal, this is an excellent model that won’t let you down. LIGHTNING FAST RESPONSE: Forget about your old remote hi-hat pedals that were sluggish and unresponsive! This premium, chain-driven high-hat pedal stand comes with a 6 feet long, flexible cable that ensures a lightning fast response, ideal for performing detailed fast work on the hi-hat. Long enough to fit around most drum kits and very easy to attach, the cable allows you to set up the stand anywhere in your drum kit. Specifications: Gross weight: 10 pounds. Hi-hat pipe diameter: 28mm. SUITED FOR PROFESSIONALS: Boasting a fully adjustable power cam system to accelerate the tension of the pedal and frictionless bearing hinges that ensure smooth drum pedal action, this is a high quality, remote high-hat pedal stand that delivers on its promises. Stable, double spine weighted pedal plates offer a sturdy, flat-footed kick, while the foot stop and adjustable floor spikes prevent slippage. The stand includes a drum key, as well as a lockable clutch with cymbal felts. BUY WITH CONFIDENCE: Being so sure about the top quality and excellent performance of our remote hi-hat foot pedal stand drum hardware, we offer you a risk-free money back guarantee of complete satisfaction!  With nothing to lose, order yours today and upgrade your drum set! This heavy duty bass drum kick pedal is double-chained and very sturdy, featuring a two-sided beater. Made of all metal, this single kick drum pedal also boasts frictionless bearing hinges for smooth pedal action, a weight spine pedal plate to help keep the pedal securely in place by preventing slippage, and beater shaft locks that prevent the beater arm from sliding out of position. Drum Throne Stand by Griffin | Padded Drummer’s Seat | Comfortable Drum Set Percussion Stool for Adults | Professional Double Braced Hardware Chair for Practice with Adjustable Height from 18" to 23"